Having hosted Music Bank for about a year, appeared on Running Man as a regular cast and landed roles in Sungkyunkwan Scandal and Deep Rooted Tree, Song Joongki is no unfamiliar face to fans out there in this K-Pop scene. His friendliness tops it all as he is never stingy with his smiles, waves and even pouts, constantly teasing his fans during both the Close-Door and Open Press Conference yesterday. 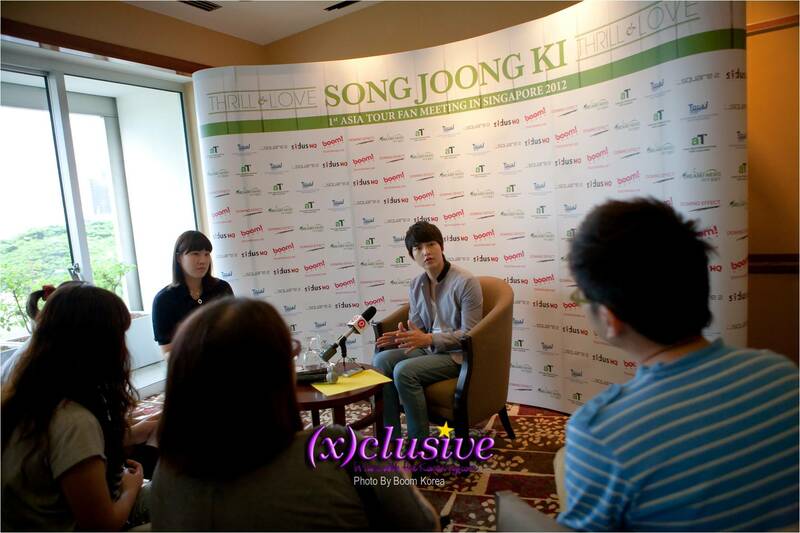 An exclusive event just for fans who bought the CAT 1 tickets, all 30 of those who attended were undeniably in for a treat as their eyes get to feast on Flower-Boy Song Joongki during his one-to-one interviews with the local media such as Razor TV and XIN MSN for approximately 2 hours. Seeing a side that not many has seen before, this behind-the-scene opportunity was indeed rare yet memorable for those present that morning. 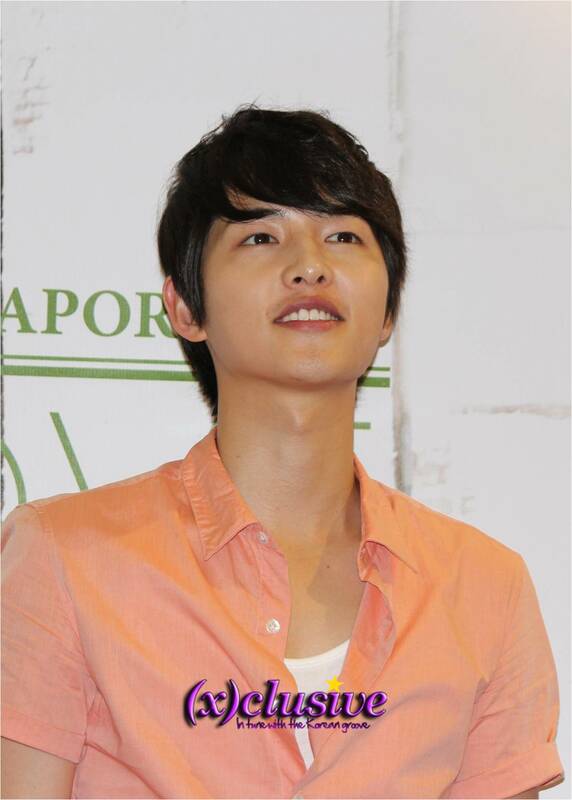 Nothing beats the friendliness of Song Joongki as he personally requested to take a photo with those present. And please note that the photos were taken row by row which means that it must have been a really up-close and personal affair with 4 to 5 fans each time. He even personally went around to shake hands with those present after the first round of interview. To be honest, he is undoubtedly sweet and a really Nice Guy (A/N: Pun totally intended). I am sure those who were present for this Close-Door Press Conference will whole-heartedly agree. 1. The three things he will bring overseas are his handphone, his cosmetics and money. 2. The sweetest thing he’s ever done for his girlfriend is to cook Bean Paste Soup. Though his girlfriend doesn’t like his cooking. 3. He misheard Flower Boy as Power Boy and said that Power Boy is Kim Jong Kook, not him. 4. He said that he’s really lucky because he heard that it’s the Great Singapore Sale now. He wants to buy some clothes and shoes. 5. On any plans to release an album since he is singing at his fanmeet tomorrow, he said ‘Never!’ but if fans request, he may dance. 6. He shared that during Dream Concert last year, one fan’s board wrote ‘If you dance, I’ll sue you!’. 7. Known for being a pretty boy, he thinks that his eyes are the prettiest. 8. He mentioned that he likes collecting shoes and defines it as a fashion item. 9. 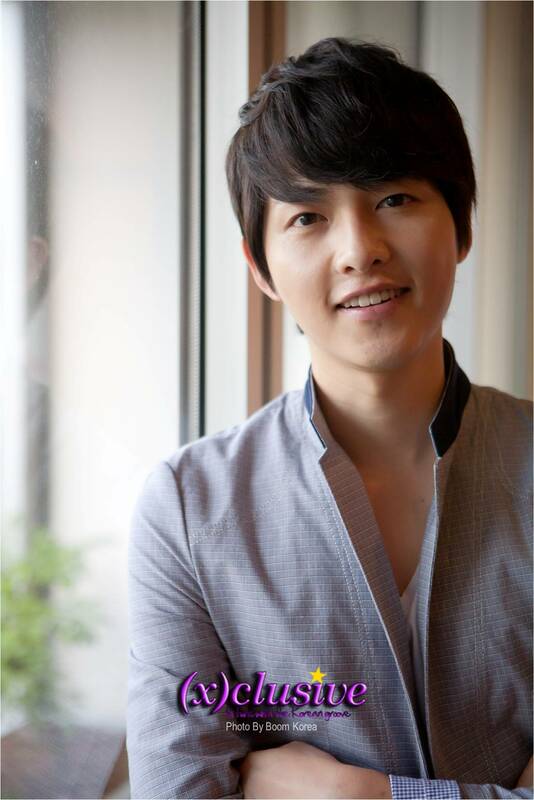 He just finished filming for the movie Wolf Boy and is going to start filming for his latest drama Nice Guy. 11. 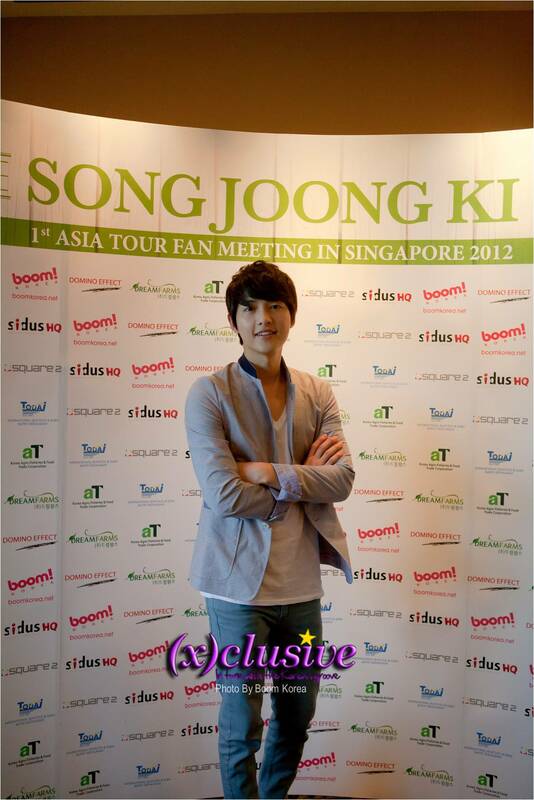 The most memorable thing SG fans have done for him? He said he remembers the Bak Kwa that fans gave him during his last trip here. For the full coverage of the Closed-Door Press Conference, do remember to keep a look out for these one-to-one interviews. 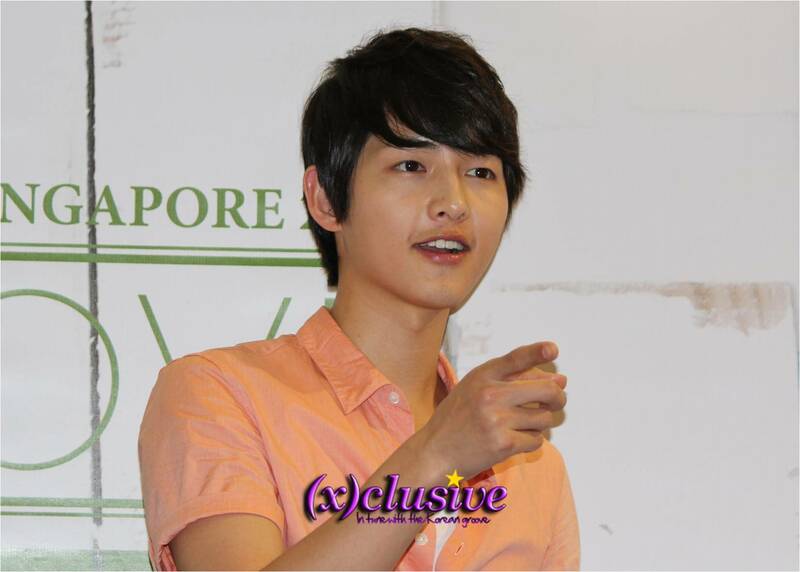 Being the first Korean artiste to have ever hosted an Open Press Conference, Song Joongki attracted hundreds of fans to Novena Square 2 where he entertained, teased and tickled fans with his witty answers. On his thoughts on Singapore, he disclosed that he prefers walking around than being restricted in the confines of a car. Having taken a jog around Marina Bay Sands on his first night in Singapore, he even revealed an interesting episode whereby when he was jogging, he met 2 fans who alighted the cab after seeing him and started running after him. Not knowing what to do, he ran even faster to ‘escape’ them. Having acted in many popular dramas in his career as an actor, he really loved all the roles that he had taken up. 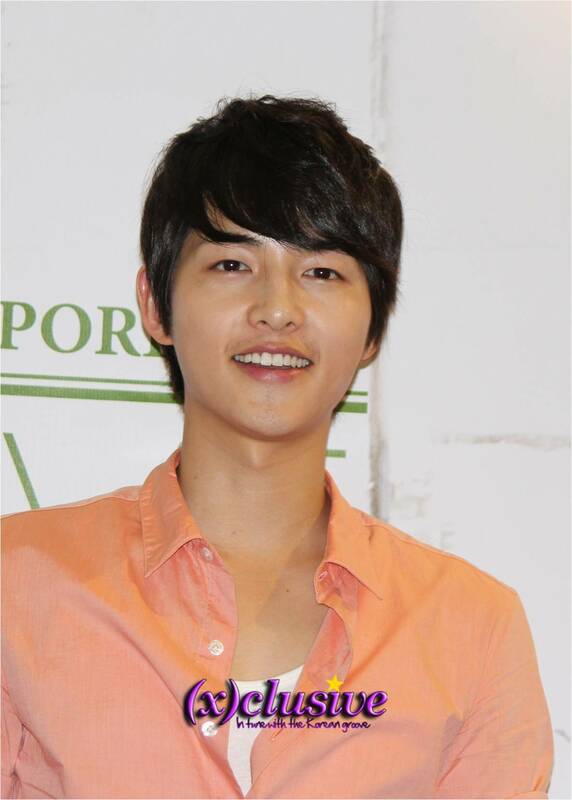 However, his role in Sungkyunkwan Scandal left him the deepest impression because that was the drama that made him even more popular. Not forgetting the fact that he was working with actors around his age such as Yoo Ah In and Park Yoochun which undeniably made the whole filming process more interesting and fun too. He was really also thankful to the love and support that was given to this drama even after a year. With regards to what kind of character he would like to try out in the future, he mentioned that he doesn’t have a specific role in mind as he doesn’t want to close his options. However, a month later, he would start the filming of Nice Guy with Moon Chae-Won and the character his is playing this time around is totally different from his role in Sungkyunkwan Scandal, so he would like fans to look forward to it when it releases. Having shown his explosive aegyo on Gag Concert, he demonstrated it too at the Open Press Conference which undeniably became the highlight that afternoon, though this said man was really shy after doing his signature ‘BU-ING BU-ING’ action. With regards to who he thinks is the best in Running Man, he spontaneously replied that it would be Kim Jong Kook because it is really hard to catch him. And during the filming of Running Man, he feels that it was really hard and tiring for him and this actually motivates him to exercise more. A cute episode happened when fans who were present kept shouting fellow Running Man regular, Lee Kwang-Su’s name and to that, Song Joongki replied with “Kwang-Su? NO! Kwang-Su is just tourist man!“, resulting in bouts of laughter from those present that afternoon. His obsession over the Bak Kwa (barbequed pork) from Bee Cheng Hiang is not to be underestimated when he was asked to describe his most memorable Singaporean fan – one that gave him a big packet of Bak Kwa when he came Singapore for Mnet Asian Music Awards last year. He even said that if he were to go shop at Square 2 now, he wants to buy some Bak Kwa and started asking around as to whether there is a Bee Cheng Hiang shop in that mall. When asked to reveal a secret about himself that no one knows, he wittily played with the word secret and said that ‘The meaning of secret means to keep to myself so I will just keep it to myself.” garnering immediate disappointments. 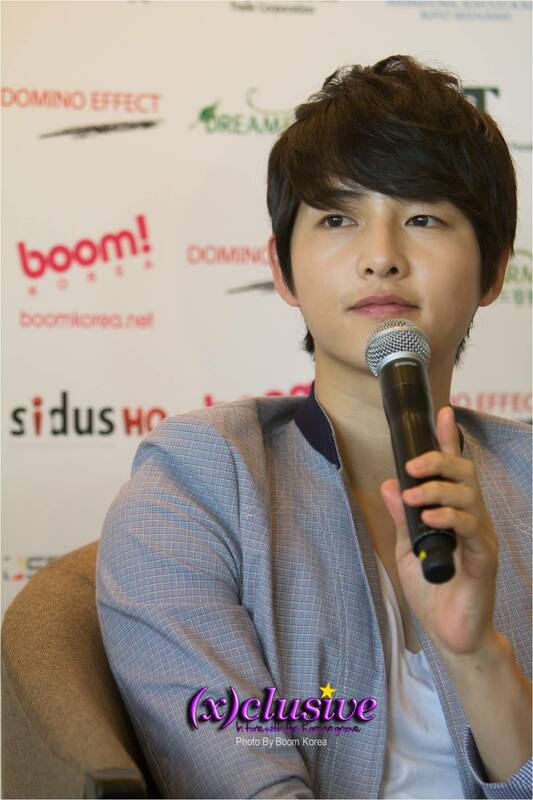 With Song Joong Ki setting a precedence this time around with an Open Press Conference, it is sure to set a trend for future Press Conferences. Much thanks to the team at Boom Korea for this innovative concept of a Close-Door Press Conference which included fans who bought CAT 1 tickets and an Open Press Conference for the public because it undeniably brought the fans closer to Song Joongki and vice versa. 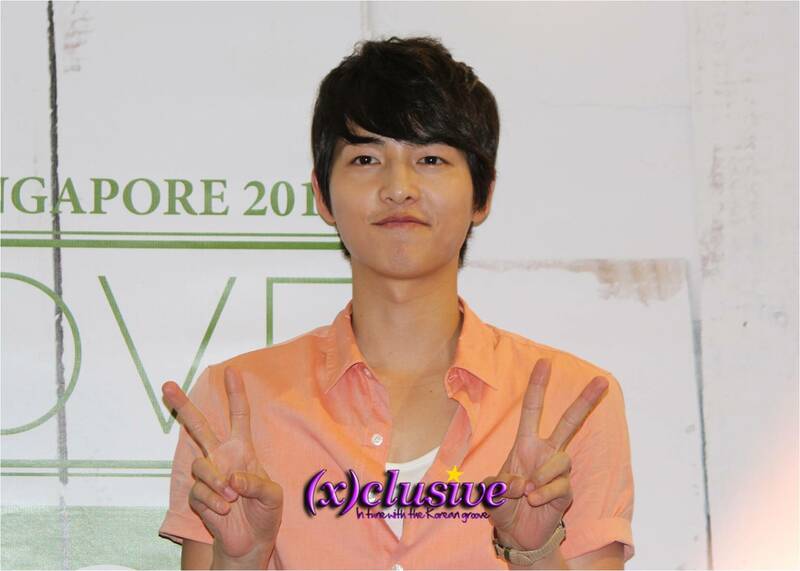 For more updates on Song Joongki’s visit in Singapore, especially with regards to his Fan Meeting later, do stay tuned to (x)clusive. ← (x)clusive! : EXCLUSIVE Interview with Cube’s newest sensation, BTOB!